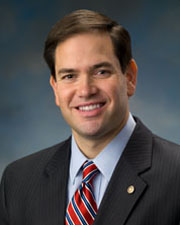 A Senator from Florida; born in Miami, Fla., May 28, 1971; graduated University of Florida, B.S., 1993; graduated University of Miami, J.D., 1996; lawyer; West Miami City Commission 1998-2000; member of the Florida House of Representatives 2000-2008; majority leader 2003-2006; speaker 2006-2008; elected as a Republican to the United States Senate for the term ending January 3, 2017. Marco Rubio's Super PAC Raised $16 Million. $8 Million of That Came From Two Donors. We are close personal friends. They trust us.